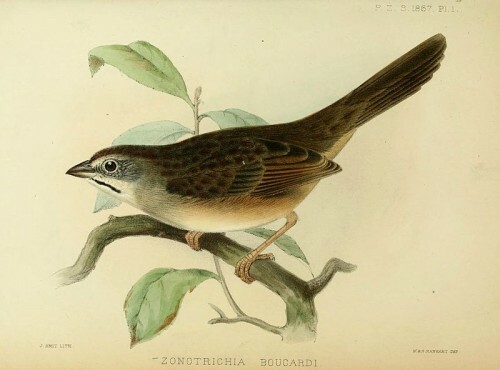 The Rufous-crowned Sparrow is a small American sparrow. 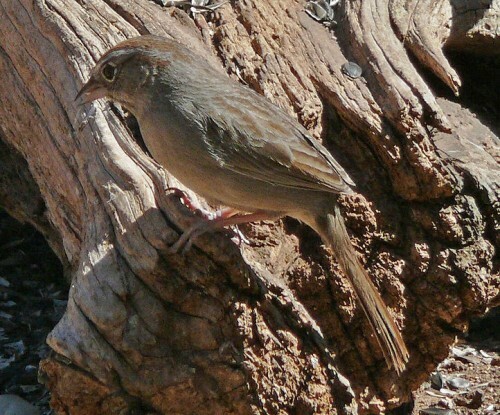 This bird is found mostly across South-western USA and Mexico. 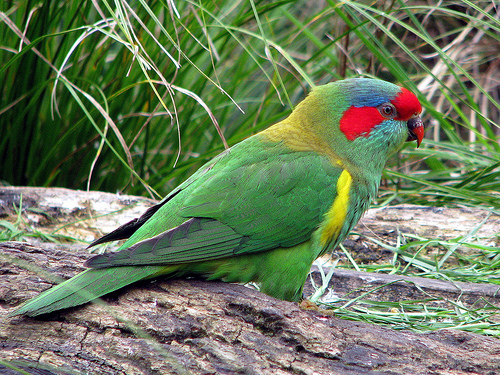 Populations of this bird are often isolated from each other. This bird has a brown back with darker streaks and grey underparts. It has a rufous crown and a grey face. There are 12 subspecies that are generally recognised, however sometimes up to 18 subspecies are named. A. r. ruficeps is the nominate species. It was first described in 1852 by Cassin. It is found on the western slopes of Sierra Nevada and the Californian coast. This subspecies is darker and smaller. It also has distinctive rufous-brown streaks on its upperparts. A. r. canescens – first described in 1922 by W. E. Clyde Todd. It is found in south-western California and north-eastern Baja California. The species is classified as being of Least Concern, but the California Department of Fish and Game states that it is a species of special concern as its population is threatened with extinction. It is similar in appearance to the A. r. ruficeps except it is slightly darker. A. r. obscura – was first described in 1923 by Donald Dickey and Adriaan van Rossem. It is currently found at the Channel Islands, Anacapa, and was formerly found at Santa Catalina. It is darker than the A. r. canescens. A. r. sanctorum was first described in 1947 by Adriaan van Rossem. It was found on the Todos Santos Islands which is close to Baja California. This subspecies is now believed to be extinct. It was the darkest of all of the coastal subspecies, particularly on its underbelly. A. r. sororia – was first described in 1898 by Robert Ridgway. It was found in Sierra de la Laguna. 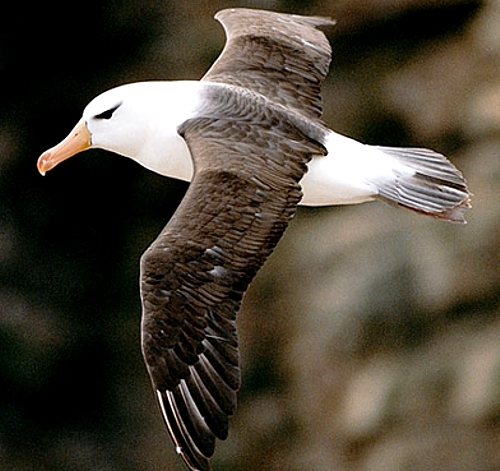 It is the palest out of all of the coastal subspecies. A. r. scottii – first described in 1888 by George Sennett. It is found from New Mexico to Arizona, to as far south as Coahuila and Sonora. It is dark grey and has darker and narrower streaks on its breast. A. r. rupicola – was first described in 1946 by van Rossem. It is found in the the mountains of Arizona’s south-west. It is similar to A. r. scotti in apperance except is has a greyer back and is darker. A. r. simulans was also described by van Rossem, but in 1934. It is found in north-western Mexico. It is more rufous in colour and has a pale underbelly. A. r. eremoeca – was first described in 1882 by N. C. Brown. It is found in Texas, New Mexico northern Chihuahua, central Coahuila, and south-eastern Colorado. It has a dark breast and greyish upperparts. A. r. fusca was first described in 1897 by Edward William Nelson. It is found in Mexico. It is darker and has more rufous upperparts compared to the A. r. australias. It also has a darker rufous crown. A. r. boucardi – described in 1867 by Philip Sclater. It is found in eastern mexico, and is a subspecies which is darker than the A. r. eremoeca. It has dull brown streaks on its chest. A. r. australia – was described in 1897 by Nelson. It is found in Mexico. It is similar to the A. r. scottii in appearance but has a shorter bill and is smaller. The other 6 subspecies recognised are A. r. pallidissima, A. r. extima, A. r. phillipsi, A. r. duponti, A. r. suttoni, and A. r. laybournae.